Every wedding is an unforgettable, beautiful occasion and your wedding day will be possibly the biggest day of your life. Amidst all of the beautiful details of your day lie often unseen moments. The loving glance, the telling touch, the secret smile. In these moments can be found the real story of your wedding day. My wedding photography is built upon the belief that it is in these moments that we capture the real beauty, we capture the love. I'm a wedding photographer and I live by the seaside in south Devon with my wife, Felicity, our two young daughters and Milly, she's the greying black lab whose growing old totally disgracefully. A few things that work for me... rock climbing, a good sing, the smell of the sea and a little bit of politics. I value kindness and honesty, I enjoy a few minutes peace with a good coffee and I like to cook, preferably a good veggie Indian. A few things that don't... the school run, being thrashed by my daughter at Foosball repeatedly and ruthlessly, rides that go round and round, building Viking long boats, Facebook and writing about myself! I've been photographing weddings for a while now and I've come to realise a couple of things about photography and weddings. Photography, I go for authenticity over perfection. What I love is capturing the truth, an unfiltered moment. I can absolutely appreciate and admire beautifully created images but for me it's about striving to find sincere emotion, feeling in a picture. Something real. When I capture emotion in a photo it takes on meaning, for me the image becomes more alive. That's what I aim for. That's what my photography is all about. Regarding weddings, I've been privileged to witness and photograph many weddings over the years and there's no question that each one is a fantastic occasion. It's a day full of beauty, positivity and happiness. There's often a little stress and panic at times but they're all essential ingredients of the story. What really grabs me about a wedding though is the fact that behind all the frills you have two people who are declaring their love for each other. Everything else that accompanies a wedding, the shoes, the outfits, the flowers, the venues and the details, they're all beautiful and part of the story but for me they are absolutely secondary to fact that two people are getting married. When all is said and done it's all about the love. I've been privileged to photograph some absolutely beautiful weddings throughout the South West and work with some lovely people. It's important to me that my images are authentic, natural and emotive, if possible also, a touch of humour never goes amiss. Here's just a selection of some of my favourite photos from various weddings from the past couple of years. My pricing and collections strategy is pretty simple and the costs and what's included in each collection are outlined below. However, I absolutely understand that every wedding is different and your plans are unique therefore nothing is set in stone and I'm more than happy to tailor my coverage to suit your exact needs. 10 Fine art prints at 7.5" x 5"
If you've not set a date yet but love the idea of celebrating your engagement with a casual photo session and some stunning pictures of you both, that's totally something we can do. A typical engagement shoot will leave you with about 30-40 beautiful images and with full license for you to print or upload as you wish. The cost of an engagement session is £150 when booked individually. The question... how would you describe your style? It's an important one to ask. The style of the photos and the approach of the photographer will probably be the overriding factor when it comes to choosing your wedding photographer. I photograph weddings because I love photography, I love that in a photograph I can capture a flash of life, not only a record of an event and time but more importantly to me, a burst of emotion that can still evoke powerful feelings years later. A wedding, while not only brimming with energy and positivity, is jam-packed with these moments and they are raw and sincere and the simplicity and honesty of that is awesome. To me they are the truly beautiful moments of a wedding day. Those moments can not be set up or arranged, those moments can not be manufactured. This determines my approach to photographing a wedding. It's about observation. It's about being relaxed, it's about allowing you to relax and to just let things naturally unfold. It's about capturing rather than creating. It's about authenticity over perfection. Those flashes of emotion come and go in an instant and to be able to see those I have to take a step back and simply observe. This means that I'm as hands off as I can realistically be. There are however, times when that's not entirely possible and I may for instance, if the situation allows, suggest moving into more favourable light, direct the family a when it comes to a group photo or guide the bride and groom a little during their portrait shoot if they are feeling a little uncomfortable but this I keep to the barest minimum as I prefer to just let you be together, be yourselves and to capture the love that flows from that. My belief is that my role is to document your wedding day as it is. So after all that I'd say that my style is organic and sincere, it's about the authenticity of the moment. 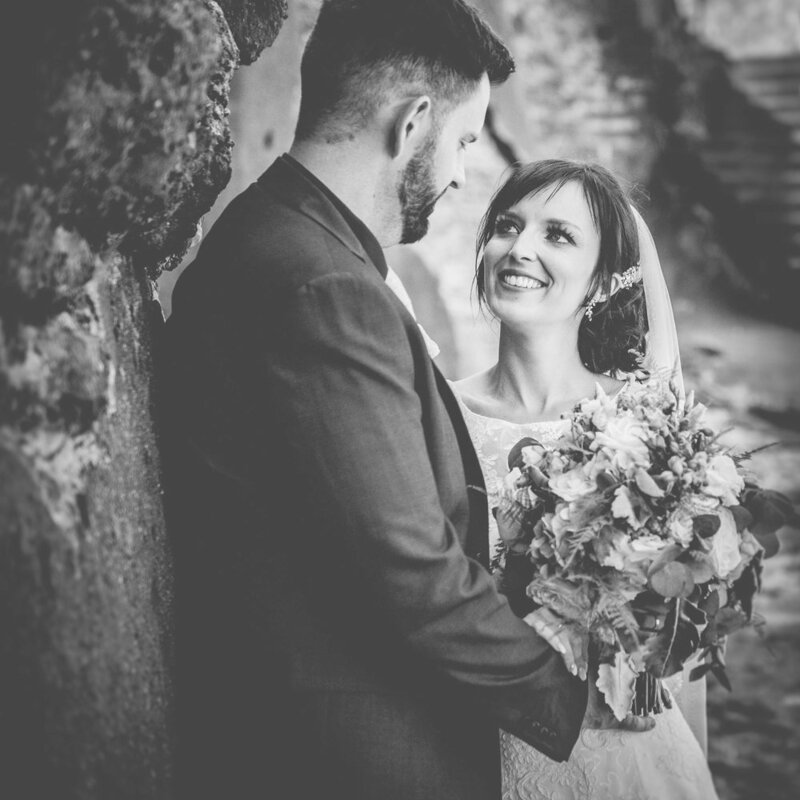 Regarding the style of my photographs... My photographs stand above all else on their content and that content is a reflection of my approach and beliefs as a wedding photographer. The style in which they are processed is very much a personal preference. I favour high contrast film style black and white images and bold true to life yet slightly dark and moody colours. This style remains consistent throughout all of my images. I've put together this FAQ list with some of the questions that couples tend to ask most often. If there's anything you'd like to know about my wedding photography that's not covered here please don't hesitate to get in touch. It's a case of "have camera, will travel". Although I'm based in Devon and work predominantly throughout the southwest I am happy to travel, though would ask for transport and accommodation expenses to be covered if you're getting married further afield. do you work to time limits ? 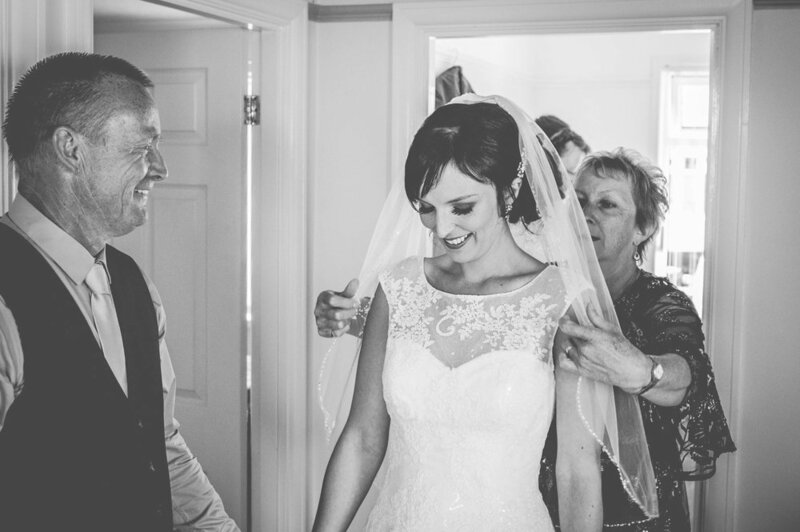 The exact plan for coverage of your wedding day will be discussed in plenty of time prior to the big day but if you have booked me for full coverage of your wedding day, I begin at the start of the day and finish at the end of the day, whatever those times may be. No restrictions, no extra charges, just unlimited coverage of your wedding day. If you have opted for the "Fitted Collection" then I will be with you for at least 5 hours from your arrival at your ceremony venue. I don't clock watch though so usually 5 hours ends up being a little more than. are you professionally insured ? Absolutely yes. I have public liability insurance and professional indemnity insurance in place. will you meet us before our wedding ? Ideally yes. If you're considering me to be your wedding photographer then there's lots to chat about and no less importantly, you need to know that I'm right for you and I need to know that you're needs can be met by the service I offer and the photos that I deliver. If distance means it's impossible to meet then phone or skype are the next best options. If you decide to book me to shoot your wedding there's I's to dot and T's to cross, we would keep in contact in the build up to your wedding before finalising all of the key details about one month before the big day. I'm always on hand to answer any questions or deal with any concerns that you might have during the build up and encourage all of my couples to contact me if there's anything at all they need help with. do you offer "engagement sessions" ? I do and I love shooting these. They're a wonderful opportunity to create some great photos of you both and they allow us the chance to become more acquainted with each other and just as importantly, you with the horrible pointy camera thing. That all helps when it comes to your wedding day and especially when it comes to your beautiful portrait shoot. They are totally casual and relaxed, you can bring your dog, take a picnic or whatever you fancy. An engagement shoot is included at no extra charge if you are booking full day coverage. To reserve your date I ask for a deposit of 25% of the total agreed fee, due upon return of my wedding booking form. The remaining balance would be due four weeks prior to your wedding date. If you'd prefer a different arrangement then that can be discussed. your social media presence ? I limit my presence on social media through personal choice. I don't use Facebook at all so you won't find me there, this I've no doubt is to some degree detrimental to my business but the whole thing is just not my cup of coffee. I do use Instagram regularly as I prefer that platform and it allows me to play more with pictures. I prefer spending my time taking photos more than working social media. Well, Britain is where we live therefore rainy is what we do. I always carry a couple of umbrellas that can be made good use of but in my experience, rain on a wedding day as only ever added to the fun and drama of the occasion. A bit of rain is not to be feared. I won't stop me from working and it won't keep you from becoming newlyweds. what happens if you're ill ? In the years I've been shooting weddings I can gladly say that I have never missed a wedding for any reason. I take the responsibility of photographing a wedding absolutely seriously and equally so my preparations in the lead up to your wedding. It would take a very grave reason to keep me from attending, however, I have a network of photographers and always have a back up plan in place which includes a replacement photographer. Rest assured though that I'll do everything in my power to ensure I'm with you as planned. do we need to feed you ? I don't make it a contracted requirement but it would be wonderfully kind of you if you could. A hot meal is very welcome during the course of a hard days work. I don't expect to sit with your party, a quiet corner away from the action is best and I'm not fussy but I am veggie. when and how will we receive our photos ? It is always my aim to deliver your photos to you within 6 weeks of the date of your wedding, however, at busier times of the year this may be realistically 8 weeks. Your photos, once hand edited by me, will initially be uploaded to a private, password controlled online gallery. This allows you the chance to see your beautiful new photos for the first time and also to share them with your friends and family. 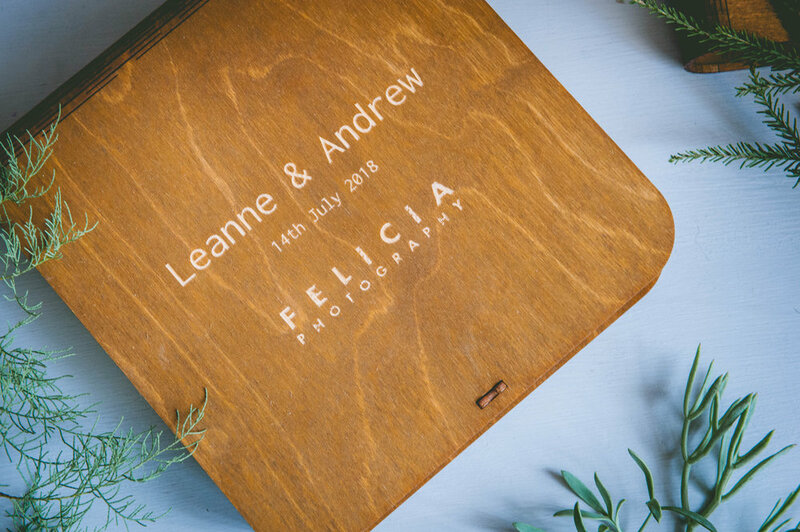 All images are then transferred to your bespoke USB package, this is an elegantly crafted hand finished wooden case, personalised with your names and the date of your wedding. This will hold your 10 free prints and your USB which will contain all of your edited wedding photos and your engagement session photos if you had one. do you offer albums or prints ? A bespoke album is a beautiful way to showcase your new wedding photos and I can certainly provide you with this option. I employ a leading national company, who just happen to be based here in Devon, to produce beautifully crafted contemporary and traditional albums that can be made as bespoke as you wish. The purchase of an album is additional to any fees agreed upon and is something we can discuss prior to your wedding day. All of the prints I give to my clients are printed to exhibition grade standard on superior quality Fuji Fine Art or Fuji Velvet Archival papers by a dedicated professional print lab. Additional prints to those provided if you've booked "The Jam-Packed Collection" can be purchased and delivered within two weeks of ordering. Costs are very realistic and orders can be placed with me at any point up to twelve months after the date of your wedding. If you're considering me to be the lucky photographer then get in touch to check my availability. Dates do get booked well in advance so give me an email, call or complete the contact form as early as possible. I'll get back to you as soon as I can and if all looks good I'll suggest we meet for a coffee and a chat about your plans. From there if you wish to go ahead it's a case of completing a little paperwork and formally booking the date. If you'd like to know if I'm available for your wedding or you have any questions please drop me a line. I'm more than happy to help in any way I can. You can call me daytime or evening, email me directly or complete the enquiry form on this page and I'll do my best to get back to you straight away.